Trains prove a good option for travelers to see more of the countryside in Vietnam, yet travel more comfortably than the bus. Up to now, Vietnam Railways System (VRS) has been the main service of domestic train. With its implementation in almost every provinces and cities in Vietnam and activity scope of 2.652 km of railway, VRS offers trips on newer trains equipped with modern air-conditioned cars and berths for comfortable overnight trips. Soft-berth has two tiers of beds (four beds per compartment), the price for each bunks are the same. These compartments have a door. Some trains may have super-berth compartments which have two beds per room with a door. The main routes are the north-south train from Hanoi to Ho Chi Minh City, trains from Hanoi to the northwest and northeast, and beyond to China. Besides, there are local trains which do not make the complete journey, but just cover part of the route. Vietnam's Reunification Express trains go between Hanoi and Ho Chi Minh City and stop at various railway stations along the coast, such as Hue, Danang, Hai Phong, Nha Trang and so forth. These trains take 36 hours to finish their itinerary. The two major kinds of trains are the: SE (SE1-SE6) and TN (TN3-TN10). SE trains are better, equipped with modern air-conditioned cars, larger windows, and restaurant or buffet car as well. 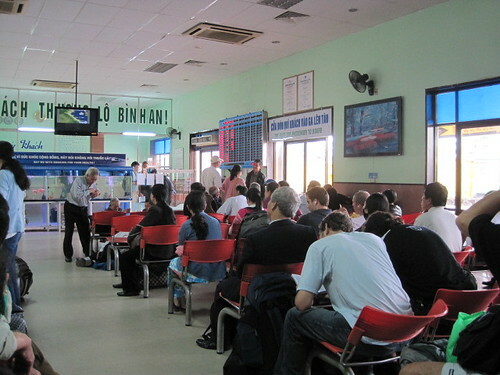 Details on fares and schedule, which are changed frequently (about every 6 months) are published thoroughly on the official website of Vietnam Railways System at: www.vr.com.vn and available at railway stations. Buying a train ticket at the railway stations is simple. You may purchase tickets in advance directly on their website above. Children : Aged 0 to 4 travel for free; 5 to 9 travel at half price; 10 and over must pay full price. Business class: Price is per cabin per way. One cabin accommodates 4 persons. - From 2 years old under 12 years old: 300.000VND / Child.